NEW YORK (F.A.S.T. Graphs) -- Sherwin-Williams (SHW - Get Report) has not only become the leading producer of paints and coatings in the United States, but it is also one of the largest producers around the globe. With the slogan "cover the earth" and more than 4,000 worldwide stores, the Cleveland-based Sherwin-Williams has been an especially colorful enterprise. Still, some might consider the company a bit boring, as using their products is literally like watching paint dry. Jim Cramer recently said that he likes Sherwin-Williams, calling it "a good housing play." First and foremost, Sherwin-Williams has been an exceptionally good corporation over the past few decades. Even beyond that, it certainly takes a strong company to last a century and a half. By viewing the past operating results of the company in graphical form, one can instantly see what I mean. Below I have included the earnings (orange line) and dividends (blue shaded area and pink line) over the past 15 years as depicted on the Fundamentals Analyzer Software Tool of F.A.S.T. Graphs. In viewing the past 15 years of operating results we can see that Sherwin-Williams grew operating earnings by about 11.5% per year, with just three of those years having a decline in earnings. In addition, the dividend grew from 54 cents a share in 2000 to $2.00 today, bringing the payout ratio to around 25%. 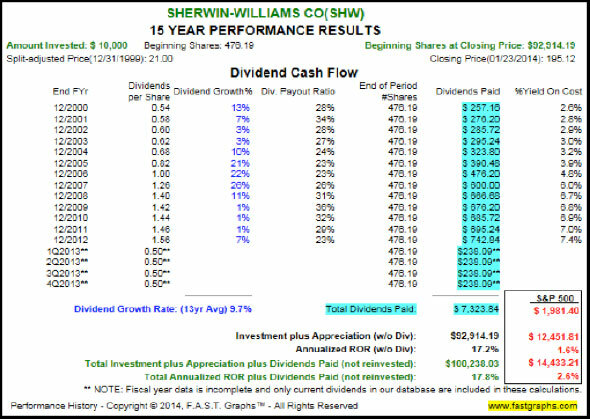 In fact, Sherwin-Williams has not only paid but also increased its dividend for 35 consecutive years. In addition to a strong operating history and solid streak of dividend increases, Sherwin-Williams has also demonstrated a propensity to continuously reduce its share count. For instance, in 1998 the company had roughly 171 million common shares outstanding as compared to just over 100 million today, a decrease of 3.5% in total share count per year. Further, the company still has the ability to repurchase roughly 13.6 million shares in conjunction with its present authorization. Given that the business performed well and the company remained committed to continuously rewarding shareholders, it follows that the performance results over this time are likely quite good. And this is precisely what we see. Over the past 15 years, Sherwin-Williams has returned almost 18% a year, against the 2.6% annual returns of the S&P 500 index over the same time period. A hypothetical $10,000 investment in Sherwin-Williams on Dec. 31, 1999, would now be worth $100,000 today -- 10 times the initial investment. It is clear that this has been relatively exceptional performance. Yet what is not yet readily apparent is that a portion of these results are directly a result of price-to-earnings expansion. More specifically, Sherwin-Williams traded at about 11.6 times earnings at the end of 1999 as compared to 25 times earnings today. This also can be observed in the capital appreciation component of the return. While the business generated operating results of 11.5% a year, the stock price grew by 17.2% a year. If we add price (the black line) to the FAST Graphs -- thus making it an earnings and price correlated graph -- we can see this relationship develop over time. 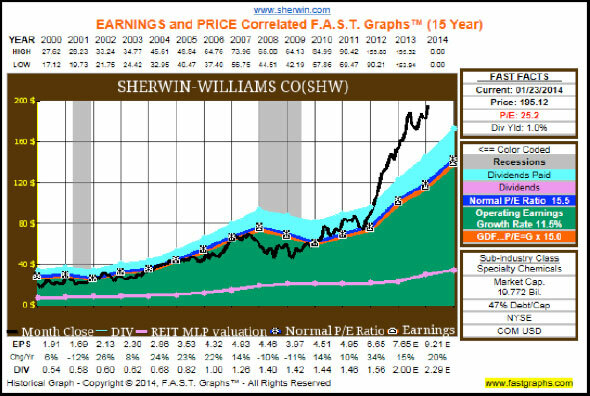 For a long time Sherwin-Williams traded slightly below 15 times earnings (the orange line). Indeed, the "normal" P/E ratio for the last 15 years has been about 15.5. However, in the past 2 years the market has commanded a much higher valuation, rocketing shares past their normal valuation range. Thus, moving forward, a potential investor should take this idea into account. We have discovered that Sherwin-Williams has been an exceptionally strong and rewarding company. Moreover, the company might very well benefit greatly from the housing recovery. Yet it is important to keep these ideas in context. By viewing the estimated earnings and return calculator below, we can observe a solid baseline for how analysts are presently viewing this company. Specifically, 19 analysts reporting to S&P come to a consensus intermediate-term estimated earnings growth rate of 14.4% -- higher than even its historical level. 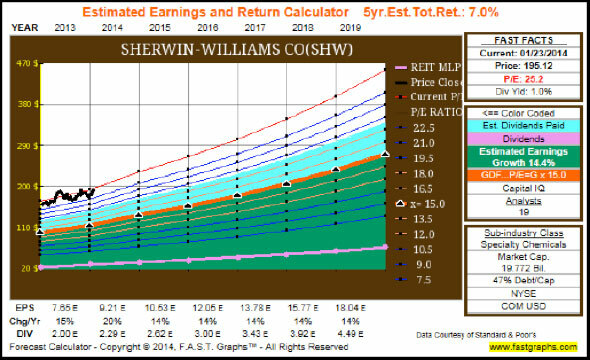 If these estimates materialize as forecast, if the dividend payout ratio remains the same, and if in 5 years Sherwin-Williams is trading at 15 times earnings, this would likely indicate a yearly performance result of about 7% a year. In other words, given the high historical P/E ratio, the performance results would likely trail the business results of the company if the P/E ratio contracted. In fact, for capital appreciation to match the business results of the company, the market would have to place a similar multiple on the company as it is presently. Overall I believe that Sherwin-Williams is an excellent company and one that should indeed prosper from a continuing housing recovery. However, this is only one side of the story. For the last 15 years Sherwin-Williams has had an average P/E around 15 and has more or less traded around this mark for the better part of the last 15 years. Today, the P/E ratio stands at 25, higher than it has ever been. In order for performance results to match business results one would need the market to continually value the company at such a lofty P/E ratio. 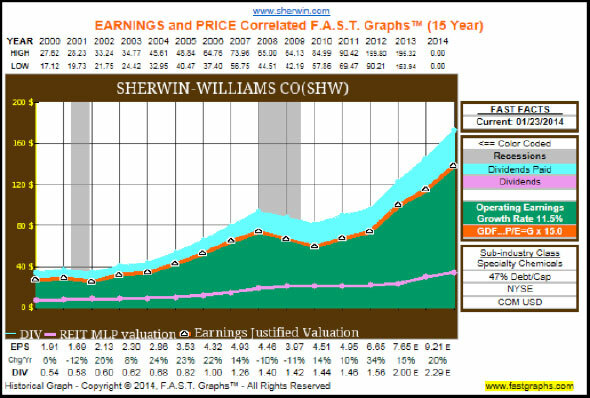 Sherwin-Williams currently appears a bit ahead of itself at today's valuation. Yet that is not to suggest that reasonable returns might not still be had in the future. 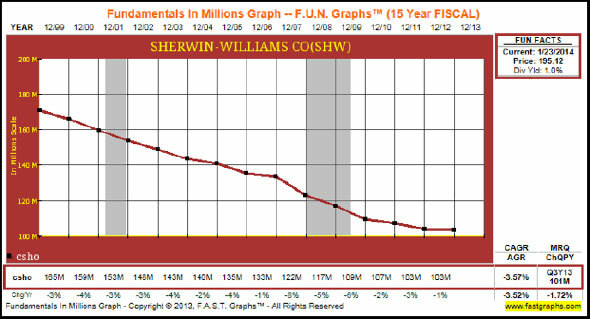 It's entirely possible for Sherwin-Williams to grow faster than estimates, increase dividends at a robust rate. It's even possible for the market to repeat its present valuation. Either case would likely enhance the prospective performance results. But personally, I would certainly say that caution is the word. However, as always, I recommend that the reader conduct his or her own thorough due diligence.